Romania's boom in sardonic, minimalist social drama (The Death of Mr. Lazarescu, 4 Months, 3 Weeks & 2 Days) continues with this low-boiling but addictive story about a young police detective who's begun to question the justice of the drug laws he's enforcing. On a tip from an informer, he surveils a trio of teens as they stand around outside smoking hashish, but he can't bring himself to bust them, knowing their victimless crime will bring them a seven-year prison sentence. Writer-director Corneliu Porumboiu (12:08 East of Bucharest) doesn't quite achieve the existential savagery of 4 Months or Mr. Lazarescu, but he pushes the other films' stripped-down style and dour absurdism to their logical extreme; the climax, an extended scene in which the detective's commanding officer uses a dictionary to unwind the young cop's ethical objections, is a marvel of dead air and unspoken oppression. In Romanian with subtitles. 115 min. 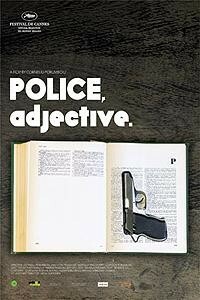 Police, Adjective is not showing in any theaters in the area.